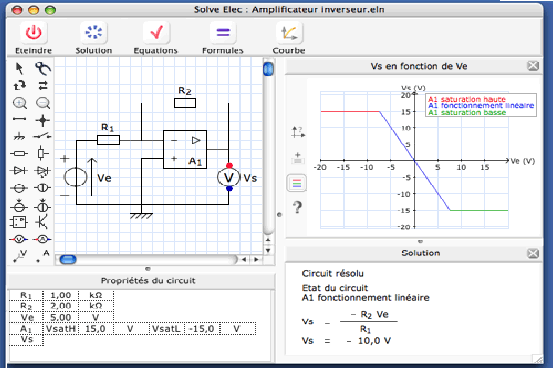 Solve Elec offers a solution for drawing and analyzing electrical and electronic circuits. In particular, it is possible to obtain the literal formulas of the intensities and voltages, to solve equations linked to the circuit, or to display curves. 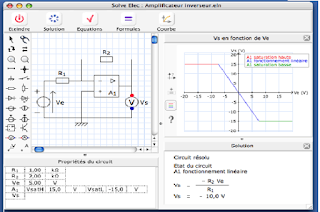 - draw and analyze electrical circuit diagrams. - obtain the literal formulas of the intensities and tensions indicated in the diagram. - check literal equations relating to the circuit. - consult an integrated documentation.